Nicholas Morrow breaks down a defender during Friday’s playoff win. 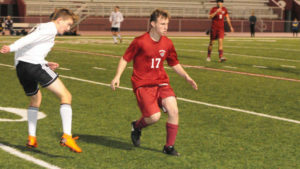 Destrehan has leaned on its defense for much of the season, and it was sturdy once again during Friday’s 5-0 home victory over visiting Natchitoches Central in the Division II boys soccer playoffs Friday night. But the offense was potent and then some, behind two goals each from Will Bryant and Rafael Soto and another from Michael Ehrmann, allowing the Wildcats to control the action from start to finish. Will Bryant scored two goals to help guide DHS to a first round win. The No. 13 seeded Wildcats advanced to round two for a matchup at No. 4 Beau Chene tonight (Feb. 6) at 6 p.m.. 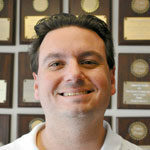 Beau Chene was a Division II finalist last season. It had a bye in round one. 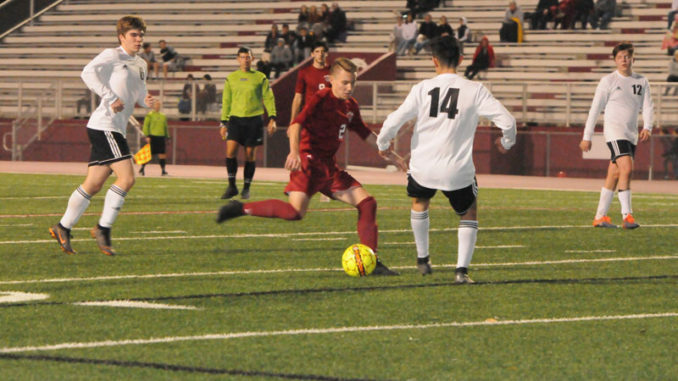 It was the first home playoff victory for Destrehan (12-5-1) in seven years, but it’s also the third year of the past four seasons the Wildcats have advanced past the first round of the playoffs. Destrehan has not lost in its last nine matches, going 8-0-1. For Soto, the two-goal day was a big boost after a scoreless individual regular season. “It’s a new season so it’s a new beginning,” said Soto, who got his first goal in the match’s sixth minute on a rebound. “The first one built my confidence, but I came out looking at this as an entirely new start. Destrehan coach Jhovanny Santamaria’s team began the season 3-0, a contrast from last season’s 0-2-2 start that saw the Wildcats surge pull themselves into the postseason from behind the pack. While the DHS boys travel to Beau Chene, the Destrehan girls will be hosting their first playoff match tonight. The Wildcats are the No. 4 seed in Div. II and host No. 20 Lee Magnet at 6:30 p.m. The Lady Wildcats earned a bye in round one, while Lee Magnet upset No. 13 West Ouachita, 4-3.